#PMRF Prime Minister Research Fellowship scheme /Prime Minister's Research Fellows (PMRF) Scheme / PM Fellowships /PMRF Prime Minister Research Fellowship scheme for PM Fellowships, Research Grant for Fellows: In a major boost for research in the country, the Union cabinet has approved the Prime Minister Research Fellowship scheme for students of higher education institutions such as IITs, NITs and IISERs. The move was also aimed at preserving the country’s talent pool. Implementation of 'Prime Minister's Research Fellows (PMRF)' scheme at a total cost of Rs.1650 crore for a period of seven years beginning 2018-19. The Government has announced the Prime Minister's Fellowship to guide students to research. The scheme intends to provide a strong educational system for the overall development of the country and to encourage talented students. This will reduce the country's requirements in the field of science and technology and reduce the faculty shortage of prestigious institutions. The Prime Minister's Fellowship has been finalized with many such inconsistencies. It starts from 2018-19 academic year. A maximum of 3000 Fellows would be selected in a three year period. From Rs 70 thousand to Rs 80 thousand per month, financial services is provided. Another Rs 2 lakh is given in the form of research grant annually. - Prime Minister's Research Fellowship Scheme for Doctoral Studies (Ph.D.) in IITs and IISc aimed at attracting the best talent. Candidates should be informed what research should be done in advance. Its interest in the topic / subject should explain why you want to research. Candidate analyzing ability and research skills should be given through the proposed project. And that's why research is needed in that aspect, and how to analyze how it serves national interests. The selected item should be relevant to current domestic needs, technology and science. Two experts in the proposal should refer to the names of the experts. The recruitment committee will take feedback from these specialists if required. There is a limit of seats per section / subjects. If they do not have the necessary PhDs in any aspect, they will be preferred. Candidates should apply online with the Statement of Purpose (SOP) or Project Abstract for their project within a fixed period of time. Projects uploaded to the central portal will automatically reach nodal institutes. The SOP informs why the proposed project is useful, how it should be, how to do it, and how the candidate is appropriate. Nodal institutes will examine candidates' project proposals with expertise. Candidates are called interviews by selecting better ones. Video conferencing will also be performed if necessary. The relevant department directs certain targets per year to the selected candidates. Everyone needs to get them. These goals are determined based on the topic / content they choose. Each year the progress of the candidates will be considered. Fellowship continues the next year if it meets a specific goal. If the goals are not met, the candidates will be transferred to the general fellowship. Or completely removed. The Prime Minister has emphasized the importance of innovation and technology for the progress and development of the nation. This fellowship scheme is key to realizing his vision of development through innovation. The scheme has been announced in the Budget Speech 2018-19. 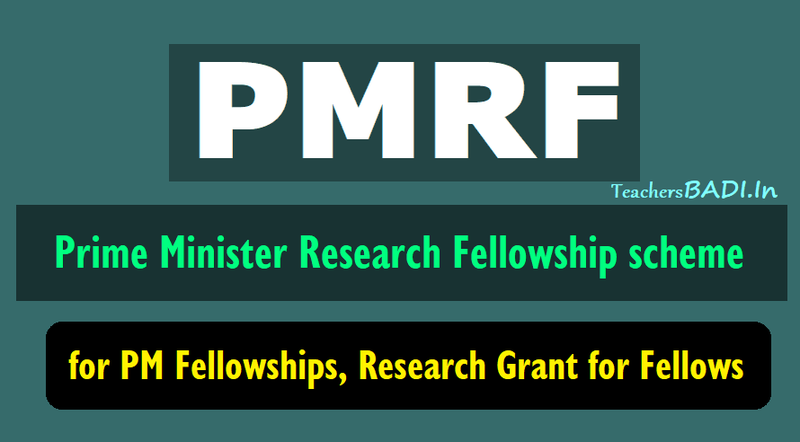 ‘Prime Minister’s Research Fellows (PMRF)’ scheme in improving the quality of research by attracting the best talents across the country. Under this scheme, the best students who have completed or are in the final year of B. Tech or Integrated M.Tech or M.Sc. in Science and Technology streams from IISc/IITs/NITs/IISERs/IIITs will be offered direct admission in PhD programme in the IITs/IISc. 1. A maximum of 3000 Fellows would be selected in a three year period, beginning 2018-19. 2. The Prime Minister Research Fellowship scheme for 1,000 B Tech students for pursuing PhD courses at IITs and IISc will help convert brain drain into brain gain. Rs.80,000/- for 4th, 5th years. Such students, who fulfill the eligibility criteria, and shortlisted through a selection process, as laid down in the PMRF Guidelines, will be offered a fellowship of Rs.70,000/- per month for the first two years, Rs.75,000/- per month for the 3rd year, and Rs.80,000/- per month in the 4th and 5th years. Apart from this, a research grant of Rs.2.00 lakh will be provided to each of the Fellows for a period of 5 years to cover their foreign travel expenses for presenting research papers in international conferences and seminars. The scheme will go a long way in tapping the talent pool of the country for carrying out research indigenously in cutting edge science and technology domains. The research under the Scheme will address our national priorities at the one hand and shortage of quality faculty in the premier educational institutions of the country, on the other. Research under the scheme will address national priorities as well as shortage of quality faculty members at premier educational institutions in the country. The scheme will cost Rs 1,650 crore for a period of seven years, beginning 2018-19.